For IEC 80601-2-30, various tests require the user to monitor the output pressure waveform, in both normal and fault condition. Most pressure meters have a slow response time and are unable to capture the waveforms accurately, for example, high but brief peak pressures in fault condition before a NIBP safety protection system operates. In addition, PC based measurement system provides a graphical record and a log of time at which pressures exceed certain thresholds such as the 15, 300 and 330mmHg. 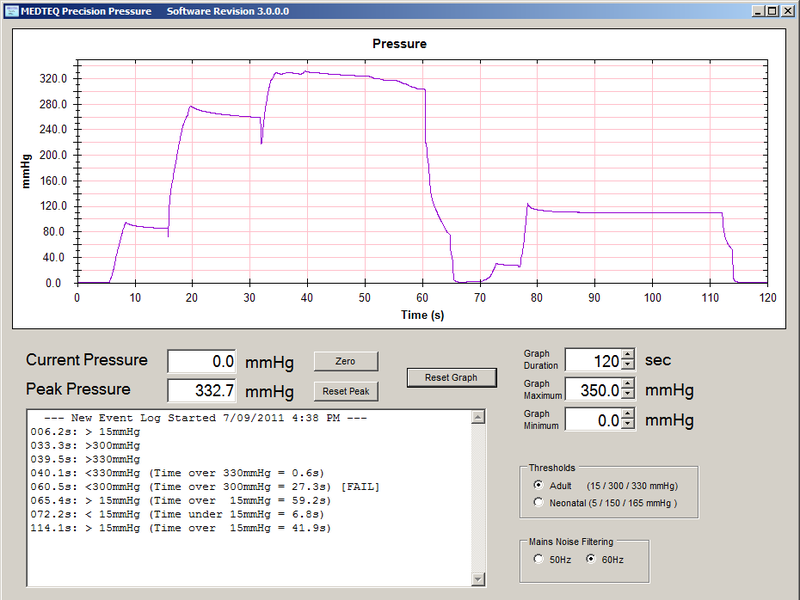 The software also automatically indicates if pressures and durations exceed the limits in the standard (e.g. >180s over 15mmHg without a break). The graphs are easily copied to word processing applications making it easy to make test reports and visualize or explain non-conforming test results. 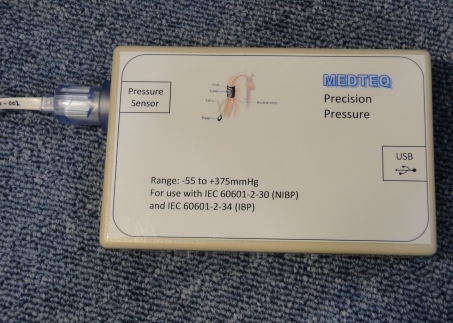 As the sensor is a normal IBP transducer, the system can also be used for other purposes, such as measurement of pressures in blood circuits. In case of measurement of occlusion pressures (e.g. in IEC 60601-2-24), special ranges up to 220kPa (around 1300mmHg) can be provided (note: high range systems may not be suitable for NIBP testing due to a loss of low range accuracy). The sensor type (external IBP sensor) is not compensated for temperature and therefore is unable to provide 0.1% accuracy over the full range as required by IEC 60601-2-34. However, the temperature variation only affects high values (above 150mmHg), which makes it practically suitable (with justification) for IEC 60601-2-34 noting the wide EUT specification (4%).